The Account Information page allows you to identify important and helpful information about your organization and your InventoryEdge account. Comptroller shows the user currently listed as the InventoryEdge Comptroller. 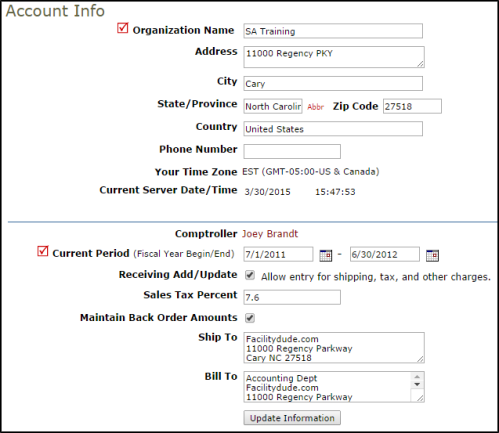 For more information about the comptroller function, see InventoryEdge Users. By checking the Receiving Add/Update check box, it will add fields for shipping, tax, and other charges to the Receiving Transaction form. Enter the Sales Tax Percent so that it will automatically calculate on the transaction. Check the Maintain Back Order Amounts box in order to allow the account to create back orders or issue partial orders for requests. Enter a Ship To and Bill To address that you would like listed in the reorder process.